CLEARANCE! One in stock and ready to ship. Don't Miss out. 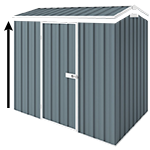 This EasyShed comes in Wheat colour and is already made and ready to ship. We only have 1 to go so don't miss out! SAVE $101 when you buy this model.